Jul 12, 2018 - A. Alcantara, Pedro Acosta-Manzano, Antonio J. Morales-Artacho, ... here: Acosta FM, Martinez-Tellez B, Sanchez-Delgado G, Alcantara JMA,. May 7, 2018 - The changes over time in EMG BSR were analysed with Friedman Test, since ...... Saul JP, Rea RF, Eckberg DL, Berger RD, Cohen RJ. Jul 3, 2007 - values that have become associated with it'' (Firey 1945, p. 140). ..... 'You're good with your hands, why don't you become an auto mechanic':. We hereby declare that we authorize Anna Lomanowska to incorporate into ...... Smart, J. L., McMahon, A. C., Massey, R. F., Akbar, G. N., & Warren, M. A. (1990). (e.g. 'I would put parts of my life on hold'), denial of illness .... I would take time out from my usual activities so that I can get back to normal quicker x0.39. 0.64. Jun 4, 1984 - The cassette recorder needed for the measurement of simple reaction time was loaned from the TUC Centenary Institute of Occupational. TromsÃ¸, Norway. 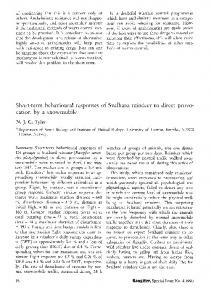 Summary: Short-term behavioural responses of. 101 groups of Svalbard reindeer (Rangifer taran- dus platyrhynchus) to direct provocation by a.
Sep 23, 2008 - The study site is located in a black cotton soil ecosystem where the ..... The feeding ecology of wildebeest and zebra in Athi-. Kaputei plains. Nitroimidazolidin-2-ylideneamine-Triazole-1-yl–2–butanone) as an active ingredient, a systemic insecticide which is a water and fat soluble. Solution of IMI was made by dissolving in the preheated (20 ºC) water. 2. Curzate® M8 (CZ) a mixture of Cymoxanil 8% with a chemical name 1-(2-Cyano-2methoxyiminoacetyl)-3-ethylurea + Mancozeb 64% with a chemical name Manganese ethylenebisdithiocarbamate polymeric complex with zinc salt is a fungicide available in the form of wettable powder hence easily dispersible in water. Solution of CZ was prepared by directly dissolving it in water. Experimental protocol for LC50 determination: Acute 96-h static bioassay was conducted in the laboratory following the methods of . The acute fish bioassay experiments for 24, 48, 72 and 96 hours were conducted. Concentrations of the test compounds used in short term definitive tests were between the lowest concentration for IMI (0.79 mg/L) and for CZ (46.0 mg/L) at which there was no mortality, and the highest concentration for IMI (0.88 mg/L) and for CZ (55.0 mg/L) at which there was 100% mortality in the range finding tests. To determine the 96-h LC50, for each concentration, ten fishes were used in 50-L containers. Three replicates were used for each concentration. During experimentation fishes were kept deprived of the feed. The aquaria were kept closed to avoid the effect from sunlight. The mortality of the fishes at 96hr were recorded and the behavioural response to each dose of each test chemical was also observed twice in the day. Statistical Analysis: Probit analysis  was used to calculate the median lethal concentration and time with their upper and lower confident limits. Toxicity data obtained as the 50% mortality endpoint were converted into toxic units (Tu) by the following formula: Tu = [1/LC50] × 100  and were characterized according to the categorization proposed by . Data of Behavioural changes for OBF and TBF were subjected to analysis of variance (ANOVA) for difference between means of both the groups using statistical program (Biostat 2009 Professional 5.8.1 and Graphpad Prism 5). Other abnormal behaviours were noted and the extent of mucus production on the skin and gills of exposed fish was assessed by feeling with the fingers. Opercular beat frequency (OBF), tail beat frequency (TBF) and cumulative mortality was recorded. A fish was considered dead when it failed to respond to simple prodding with a glass rod. Death was defined as complete immobility with no flexion of the abdomen upon forced extensions . their bodies, was more pronounced at higher concentrations, suggesting sensitivity to the agrochemicals , . Also the over secretion of mucus was observed on the fishes treated to pesticide. reported that external mucus reflects metabolic processes that take place in the fish organs, which may serve also as a criterion of the physiological status of the fish leading to the establishment of specific effects that different factors such as toxicant and the environment produce on it. The accumulation of mucus on the gills reduces respiratory activity which prevents the gill surface from carrying out active gaseous exchange and thereby causing death of the fish . According to  accumulation of mucus on the gills and distortion of gill architecture a common effect of toxicants on the gills may impair gill functions resulting in an internal toxic environment from the accumulation of nitrogenous wastes in the body leading to death. The behavioural response to agrocheimcals with marked deviation in the rate of OBF and TBF in control group fishes imputes an adjustment in physical fitness as a result of the stress condition , . The OBF in fish exposed to the agrochemicals was least variable at the 24th and 48th hrs however; it was depressed and less variable at 48th and 96th hours. This may be due to the gill damage, where the toxicant acts as respiratory poison possibly affecting the gills, impairing respiration and leading to various abnormal behaviour and eventually death . Changes in behavioural patterns exhibited by fish were possibly to counteract aquatic hypoxia condition  caused by the agrochemical. When there is impossibility of escape from hypoxic stress, physiological alterations may be evoked to compensate for low oxygen supply , . Similarly the fishes in control experiment showed limited variation in the TBF, whereas in the treated animals the TBF showed a gradual decrease with increase in time. and  have proved the TBF as a predictor of swimming speed and oxygen consumption. The stressful behaviours of exposed fish such as erratic swimming reflected increased OBF and TBF, regular visit to the surface to gulp in air, loss of balance, restlessness and finally death of fish in this study agree with the findings of , , , , . Thus, on the exposure to both the agrochemicals fresh water fish L. rohita showed immediate behavioral changes such as surfacing, followed by vigorous and erratic swimming associated with agitation. V. CONCLUSION The present studies indicate that these abnormal changes in the fish exposed to lethal concentration of IMI and CZ are time dependant. The LC50 values were found to decrease constantly with increasing of exposure periods, signifying that even at very low concentration the agrochemical particularly IMI was fatal for the fish compared to CZ. Hence, from the present studies one can conclude that the acute response of the both the agrochemicals demonstrated variation perhaps due to their physiological status and this reflected the change in their behavior. VI. ACKNOWLEDGMENT The authors express their sincere thanks to Department of Zoology, The Maharaja Sayajirao University of Baroda for providing the facilities to carry out the research work. One of authors is grateful to University for providing the scholarship to carry out the research work. Langston, W.J., (1990). Toxic effects of metals and the incidence of metal pollution in marine ecosystems. In: Firness, R.W. Rainbow, P.S. (Eds. ), Heavy Metals in the Marine Environment. CRC Press, Boca Raton, FL, pp: 101-122. Kurian, J. and Natarajan, K. (1997). Studies on Wastewater from Automobile Service Stations. Indian Journal of Environmental Health; 39(1): 37-43. Ramaswamy, V., Boucher, O., Haigh, J., Hauglustaine, D., Haywood, J., Myhre, G., Nakajima, T., Shi, G.Y. and Solomon, S. (2007). (Eds. ), Radiative Forcing of Climate Change, Cambridge University Press, Cambridge, United Kingdom and New York, New York, USA. Zhang, W., Jiang, F. and Ou, J. (2011). Global pesticide consumption and pollution: with China as a focus. 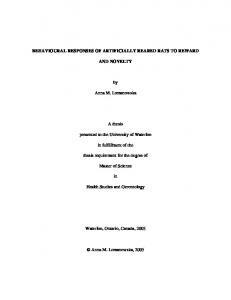 Proceedings of the International Academy of Ecology and Environmental Sciences, 1(2): 125-144. Casarez, E. (2001). Basic Prinicples of Toxicology BIOC 597c. Yuill, T. and Miller, M. (2008). Dose-response relationship" in Encyclopedia of Earth. (eds: C.J. Cleve- land,) Environmental Information Coalition, National Council for Science and the Environment: Washington. Nikam, S.M. Shejule, K.B. and Patil, R.B. (2011). Study of acute toxicity of Metasystox on the freshwater fish, Nemacheilus botia, from Kedrai dam in Maharashtra, India. Biology and Medicine, 3(4): 13-17. Amweg, E.L. and Weston, D.P. (2005). Use and toxicity of pyrethroid pesticides in the Central Valley, California, USA. Environ Toxicol Chem., 24:1300-1301. Johnson, W.W. and Finley, M.T. (1980). Handbook of Acute Toxicity of Chemicals to Fish and Aquatic Invertebrates. U.S. Department of the Interior, Fish and Wildlife Service Resource Publication 137.Washington. Finney, D.J. (1978). Statistical Method in Biological Assay, 3rd edition. London: Cambridge University Press: 508. Hahn, E.D. and Soyer, R. (2008). Probit and Logit Models: Differences in a Multivariate Realm. 28: 1-14. Clotfelter, E. D., A. M. Bell, et al. (2004). "The role of animal behaviour in the study of endocrine-disrupting chemicals." Animal Behaviour, 68: 665-676.
International Journal of Open Scientific Research IJOSR ©KINDI PUBLICATIONS www.kindipublication.com 13. Keenleyside, M.H.A. (1979). Diversity and adaptation in fish behavior. Zoophysiology, Springer-Verlag, Berlin, 11: 208. Halappa, R. and,David, M. (2009). Behavioural Responses of the Freshwater Fish, Cyprinus carpio (Linnaeus) Following Sublethal Exposure to Chlorpyrifos). Turkish Journal of Fisheries and Aquatic Sciences 9: 233-238. Little, E.E., Fairchild, J.F., and DeLonay, A.J. (1993). 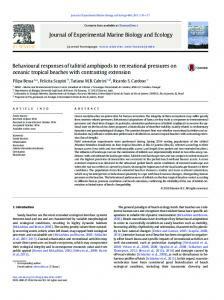 Behavioral methods for assessing the impacts of contaminants on early life stage fishes. In American Fisheries Society Symposium 14 Water Quality and the Early Life Stages of Fishes. L. Fuiman (ed). American Fisheries Society, Bethesda. Henry, M.G. and Atchison, G.J. (1986). Behavioral changes in social groups of bluegills exposed to copper. Trans. Am. Fish. Soc., 115: 590-595. Chrousos, G. P. (1998). 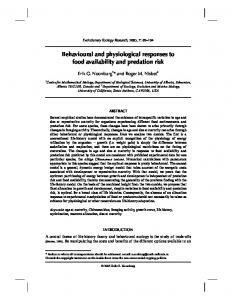 Stressors, stress and neuro-endocrine integration of the adaptive response. Ann. N. Y. Acad. Sci. 851: 311-335. Morgan, J.D., Vigers, G.A., Farrell, A.P., Janz, D.M. and Maniville, J.F. (1991). Acute avoidance reactions and behavioral responses of juvenile rainbow trout (Oncorhynchus mykiss) to Garlon 4, G arlon 3A and vision herbicides. Environ. Toxicol. Chem., 10: 73-39. Gormley, K.L. and Teather, K.L. (2003). Developmental, behavioral, and reproductive effects experienced by Japanese medaka (Oryzias latipes) in response to short-term exposure to endosulfan. Ecotoxicol. Environ. Saf., 54(3): 330-338. Chindah, A.C., Sikoki, F.D. and Vincnet-Akpu, I. (2004). Toxicity of an Organnophosphate pesticide (Chloropyrifos) on a common Niger Delta wetland fish - Tilapia guineensis (Blecker 1862). J. A ppl. Sci. Environ. M gt., 8(2): 11-17. Perkins, E.J.J. and Schlenk, D. (2005). In vivo acetylcholinesterase inhibition, metabolism and toxicokinetics of aldicarb in channel catfish: Role of biotransformation in acute toxicity. Toxicol Sci., 53(2): 308-315. Ujagwung, G.U., Koffi, M.B. and Simeon, E.O. (2010). Acute Toxicity and Behavioural Responses of African Catfish, Clarias gariepinus to Amine Salt of 2,4-D. Chin J Appl Environ Biol., 16(3): 347-352. APHA (1985). American Public Health Association. Standard Methods for the examination of water and waste water. 15th edition, 476. Michniewicz, M., Nalecz-Jawecki, G., Stufka-Olczyk, J. and Sawicki, J. (2000). Comparison of chemical composition and toxicity of wastewaters from pulp industry. In: Persoone G., Janssen C.R. and De Coen W. (Eds.) New microbiotest for routine toxicity screening and biomonitoring Kluwer Academic / Plenum Publishers, New York, 401411. 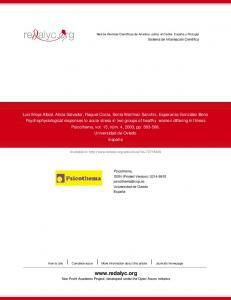 Isidori, M., Parrella, A., Piazza, C.M.L. and Strada, R. (2000). Toxicity screening of surface waters in southern Italy with Toxkit microbiotests. In: Persoone G., Janssen C.R. and De Coen W. (Eds.) New microbiotest for routine toxicity screening and biomonitoring Kluwer Academic / Plenum Publishers, New York, 289-293. Lockwood A. P. M. (1976). Effects of Pollutants on Aquatic Organisms. Cambridge University Press, 193. Kamble S.M., Bhagwan H.K. and Chinte D.N. (2011). Acute toxicity of sevin concentration on mortality and behaviour of freshwater fish Barilius barila. International Refered research journal, 2(23): 15-17. John, P.J. (2007). Alteration of certain blood parameters of freshwater teleost, Mystus vittatus after chronic exposure to Metasystox and Sevin. Fish Physiology and Biochemistry, 33: 15-20. Vasait, J.D. and Patil, V.T. (2005). The toxic evaluation of organophosphorus insecticide monocrotophos on the edible fish species Nemacheilus botia. Ecology Environment and Conservation, 8(1): 95-98. Hedayati, A., Tarkhani, R. and Shadi, A. (2012). Investigation of Acute Toxicity of Two Pesticides Diazinon and Deltamethrin, on Blue Gourami, Trichogaster trichopterus (Pallus). Global Veterinaria, 8(5): 440-444. Kreutz, L.C., Barcellos, L.J.G., Silva, T.O., Anziliero, D., Martins, D. Lorenson, M., Marteninghe, A. and Silva, L.B. (2008). Acute toxicity test of agricultural pesticides on silver catfish (Rhamdia quelen) fingerlings. Ciência Rural., 38(4):1050-1055. Dell'Omo, G. (2002). Behavioural Ecotoxicology. Published by Wiley and Sons, New York. 463 pp (hardcover). ISBN 0471968528. Wu, J.P. and Chen, H.C. (2004). Effects of cadmium and zinc on oxygen consumption, ammonium excretion, and osmoregulation of white shrimp (Litopenaeus vannamei). Chemosphere. 5:1591-1598. Shwetha, A., Dube, A. and Hosetti, B.B. (2012). Effect of exposure to sublethal concentrations of zinc cyanide on tissue atpase activity in the fresh water fish, Cirrhinus mrigala (Ham). Arch. Biol. Sci., Belgrade, 64(1), 257-263. Lebedeva, N.E., Vosyliene, M.Z. and Golovkina, T.V. (1998). Changes in the biochemical composition of mucus of fish under the effect of environmental factors. Reports of Russian Academy of Sciences, 362(5): 713-715. Omitoyin, B.O., Ogunsanmi, A.O. and Adesina, B.T. (1999). Studies on acute toxicity of piscicidal plant extracts (Tetrapleura tetraptera) on tilapia (Sarotherodon galilacus) fingerlings. Trop. J. Anim. Sci., 2: 191-197. Srivastava, A.K., Mishra, D., Shrivastava, S., Srivastav, S.K. and Srivastav, A.K. (2010). Acute Toxicity And Behavioural Responses Of Heteropneustes Fossilis To An Organophosphate Insecticide, Dimethoate. International Journal of Pharma and Bio Sciences, 1(4): B359 - B363. Edwards, C. A. and Fusher, S.W. (1991). The use of chlorinesterases measurements in assessing the impacts of pesticides on terrestrial and aquatic invertebrates. In P. Mineau, ed. Chlorinesterases - inhibiting insecticides. Their impact on wild and the environment. Elsevier, Amsterdam, The Netherlands: 255 - 275. Leight, A.E. and Van Dolah, R.F. (1999). Acute toxicity of the insecticide endosulfan, chlorophyrifos and malathion to the epibenthic estuarine amphipod Gammarus palustris (Bousfield). Environ. Toxicol. Chem., 18(50): 958-964. Kane, A.S., Salierno, J.D. and Brewer, S.K. (2005). Fish models in behavioral toxicology: Automated techniques, updates and perspectives. In: Ostrander, GK, editor. Methods in Aquatic Toxicology (Chapter 32), Volume 2. Lewis Publishers, Boca Raton, FL. Pages 559-590. Kind, P.K., Grigg, G.C. and Booth, G.T. (2002). 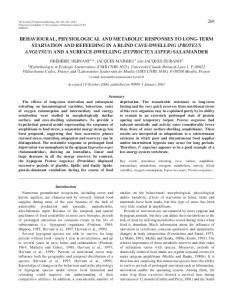 Physiological responses to prolonged aquatic hypoxia in the Queensland lungfish, Neoceratodus forsteri. Resp Physiol Neurobiol., 132: 179-190. Graham, J.B. (1997). Air breathing fishes: Evolution, Diversity and Adaptation. Academics Press, San Diego. Val, A.L., Silva, M.N.P. and Almeida-Val, V.M.F. (1998). Hypoxia adaptation in fish of the Amazon: a never ending task. S Afri J Zool., 33(2): 107-114. Steinhausen, M.F., Steffensen, J.F. and Andersen, N.G. (2005). Tail beat frequency as a predictor of swimming speed and oxygen consumption of saithe (Pollachius virens) and whiting (Merlangius merlangus) during forced swimming. Marine Biology, 148(1):1 97-204. Herskin, J. and Steffensen J.F. (1998). Energy savings in sea bass swimming in a school: measurements of tail beat frequency and oxygen consumption at different swimming speeds. J Fish Biol., 53:366-376. Shah, S.L., (2002). 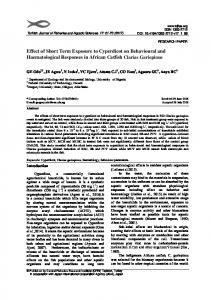 Behavioural abnormalities and Cyprinion watsoni on exposure to copper and zinc. Turk. J. Zool., 26: 137-140. Oti, E.E. (2002). Acute toxicity of cassava mill effluent to the African catfish fingerlings. J. Environ, Biology, 20(3): 112-117. Chukwu, L.O. and Okpe, H.A. (2006). Differential responses of Tilapaia guineensis fingerlings inorganic fertilizer under various salinity regime Lockwoods. J Environ Biol., 27: 687- 690. Omitoyin, B.O. Ajani, E.K., Adesina, B.T. and Okuagu, C.N.F. (2006). Toxicity of lindane (gamma hexachlorocyclohexane) to Clarias gariepinus (Burchell 1822). W. J. Zool., 1: 57-63.
International Journal of Open Scientific Research IJOSR ©KINDI PUBLICATIONS www.kindipublication.com 54. Desai, B. And Parikh, P. 2013. Biochemical Alterations on Exposure of Imidacloprid and Curzate on Fresh Water Fish Oreochromis mossambicus and Labeo rohita. Indian Journal of Forensic Medicine & Toxicology, 7: 87-91. 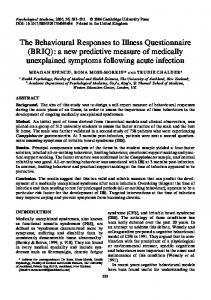 Report "Behavioural responses to acute exposure of ..."